In 2008, under the Barnett Government, WA’s uranium ban was lifted; allowing for the approval of four separate mining projects in WA. This was done by the Liberal government in the months leading up to the caretaker period. Piers Verstegen, director of Conservation Council of WA, remarked "Environmental standards went out the window under the Barnett government," and disclosed his belief that there were “serious legal flaws in the way these approvals were granted” by the Barnett government. Under the following Labour government, the ban was reinstated however, the four projects have been allowed to continue, with Mines and Petroleum Minister Bill Johnston explaining that the government could not legally deny secondary approvals for those already granted. Minister Johnston further added that due to these previously-granted leases, the WA government could be liable to recompense the leaseholders, should the government reintroduce a blanket ban on uranium projects. 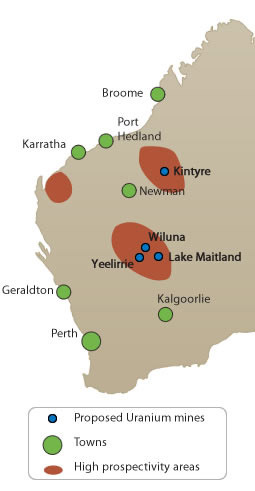 The four uranium projects in WA are Toro Energy's Wiluna project, Vimy Resources' Mulga Rock project, and Cameco's Kintyre and Yeelirrie projects. The latter of these sites -- the lease granted by former state environment minister Albert Jacob sixteen days before the pre-election caretaker mode began -- is of global scientific concern as it is the site of the 2012 discovery of seven new species, one subspecies, and three potential cryptic species of subterranean microfauna. The WA Department of Mining, Industry Regulation & Safety notes that “the EPA…recommended the project was not to be implemented due to the risk of extinction of several species…” and yet approval was granted by WA Minister for state development on Jan 16th 2017 “upon considering the broader social and economic benefits”; overruling the EPA’s decision. Greens (WA) MP Robin Chapple has accused the government of bowing to industry pressure, with Mr Vergtegen maintaining that “[the] ruling shows that indeed our environmental laws are deeply inadequate”. This position is supported by many others including Tjiwarl native title holder Vicky Abdullah and groups such as the CCWA. To date, there have been more than 200 reported spills, leaks and breaches at the Ranger Uranium mine near Kakadu National park, the latest being more than a million litres of toxic sludge spilling from a waste tank on 7 December 2013. This demonstrates that the uranium industry has failed to meet public expectations, failed to meet government regulations and failed to operate safely. 4 March 2015, "Sneaky approval of questionable Uranium proposal"
6 October 2014, "Wiluna Uranium Extension not fooling anyone"
12 August 2014, "Uranium miner Areva quizzed over Royalties for Regions payment"
17 July 2014, "Marmion wants a radioactive state"